Mac users are accustomed to looking at their Windows-using friends, with their virus checkers and spyware and the like, and feeling just a little bit superior. And it’s with good reason—so far, the Mac hasn’t been plagued with the security problems that Windows has. But things are changing. As the Mac grows in popularity, it becomes a bigger target for hackers and the authors of virus programs. And of course, some of the biggest privacy and security risks a Mac user will face won’t be on the Mac itself. They’ll happen when personal data moves over the big, wide world of the Internet, where criminals are actually lurking, trying to steal data, identities, and—of course—money. 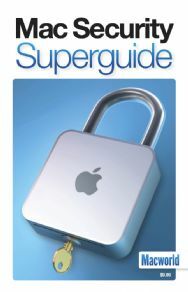 That’s why we created the brand-new Macworld Mac Security Superguide. In one handy 84-page volume, we’ve collected everything you need to know to keep yourself safe and secure, from the data on your hard drive to the data you send over the Internet. We show you how to protect your home network and avoid infection with nasty viruses. The book—available as a $9.95 PDF download (with no digital rights management of any kind—just read it using Adobe Reader or Apple’s Preview application! ), or a $12.95 PDF on CD-ROM, or a beautiful $19.95 full-color, handy pocket-sized paperback book—gives you tips about the most important single item in any user’s security arsenal: your own brain. That’s right—the biggest security holes in the world come from human behavior, not computer programs. Skills like choosing good passwords and learning how to avoid giving data to fake Web sites set up by scammers will serve you well, and this book will help you start down that safe and secure path. Sure, it’s scary out there. And yes, as a Mac user you are fundamentally safer than your Windows brethren. But you know what? Being safer than someone else doesn’t mean you’re invincible. You still need to protect yourself. Let this book be your guide. Want to see more before you shell out for this book? We’ve created a downloadable sample (1.2MB) that includes the book’s complete table of contents as well as sample pages. Also available in our Superguide series are the Mac Basics Superguide Leopard Edition, Mac OS X Hints, Total Leopard, the Macworld Digital Photography Superguide, and the Digital Music and Video Superguide. We think they’re really great books, and we think you will, too.